Have you ever been to a party or “meet and greet” reception, where the entire time you had to juggle your drink, and appetizer plate. Maybe you decided to just hold one at a time. But, then you have the problem of… “Where did I put my drink down”?? The Party Pal Appetizer Plate with Drink Holder solves that problem beautifully. The set is perfect for any type of party or meeting. This is especially true when it is a party designed for standing, eating, and mingling. 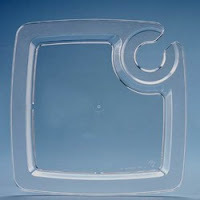 With the specially designed cut out, any stemmed plastic glassware, or stemmed coffee cup will fit. When you are not drinking from your cup, just slide it into the slot on the appetizer plate. The quality designed appetizer plate is manufactured by Covalence. It is deep enough that any sauces or dips stay on the plate, not on you. Solve the problem of party etiquette and mingling with the Party Pal Appetizer Plates with Drink Holder. Order these now from Reliable Paper! Have them ready for your next event.